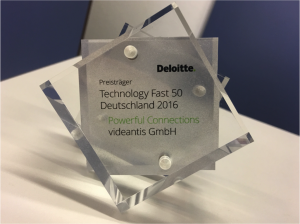 On November 10th we announced that we won our second Deloitte Technology Fast 50 award. The ranking identifies the 50 fastest-growing German technology companies with the highest percentage of revenue growth over the past four years. Our CEO Hans-Joachim Stolberg said, “Especially in automotive, we’ve seen a lot of growth due to the industry’s rapid adoption of advanced driver assistance systems that make our cars safer and more relaxing to drive. If there’s one thing the automotive industry agrees on, it’s that driverless cars need lots of cameras and sensors to understand their surroundings.” The automotive industry is where a lot of the tough computer vision problems are being solved today, since accuracy and speed are paramount there, but we’re also seeing a rapidly growing demand to integrate the same technologies we’ve developed into mobile phones and IoT devices. In September SoftBank bought ARM for $32B, 40% more than its listed stock price at the time. Why was SoftBank willing to pay so much more than the market thought the company was worth? There seems so little synergy between this processor IP company and SoftBank’s telecommunications products. 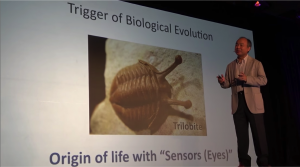 SoftBank’s CEO Masayoshi Son gave a keynote presentation at ARM’s own TechCon event where he laid out his thinking. Masayoshi started his talk in an unconventional way, asking everyone to close their eyes for a moment, and then open them again. Within a few seconds he made it clear that your eyes give you a completely different experience of the world around you. Google just released a fun game that uses their Cloud Vision API to recognize line drawings. The game is like pictionary: the computer guesses the word or phrase that describes what you’re drawing. You’re prompted to draw an image in under 20 seconds with your mouse cursor in such a way that a neural network can identify it.